Crazy weather reporters are perhaps a trope for a reason - it's because there seem to be a ton of them out there. 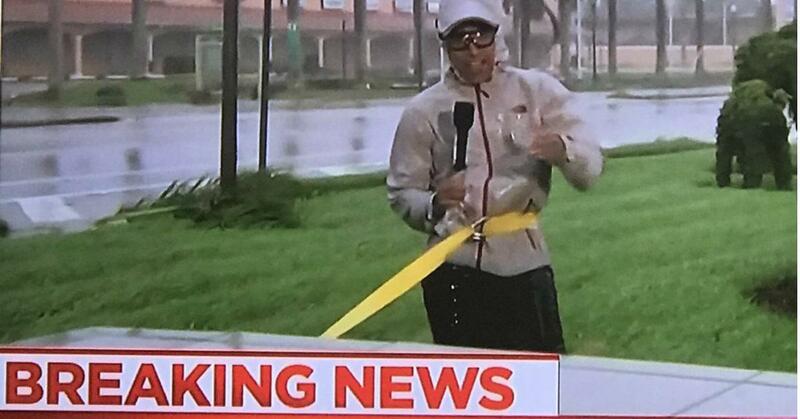 I guess there's no substitute for seeing how crazy a storm is than by seeing the effect it has on a single person with a microphone doing their best to not be toppled over by it. But there are some reporters who are in it for the long haul. For example, there are some reporters who plan on hunkering down in the storm and not allowing anything from stopping them from doing their jobs. Like this journalist who harnessed himself to a building in order to brave the storm. To say people were impressed with Almaguer's fortitude is an understatement. I've seen a lot of @Miguelnbc reporting. You've got that wrong. He isn't harnessed to the building, the building is harnessed to him. It also started a whole conversation on just why reporters throw themselves in the middle of storms in the first place. I really feel like we could leave the cameras outside and do commentary from inside the buildings. We have technology. Why tho? Just why do reporters have to do live shots outside in a hurricane?!? Now what fun would that be? Verkest has got a point.